In general, grade technologies automate or control a range of machine functions that simplify and improve operations on a wide variety of construction machines, including dozers, motor graders, and hydraulic excavators. Some GUIDE operators to grade through a visual cab display—showing where to cut and fill and giving feedback along the way. Some CONTROL the blade or bucket automatically—eliminating or greatly reducing manual effort. Some are now integrated standard features. What is Grade with Assist? Cat Grade with Assist brings grading speed and accuracy to a new level by automating boom and bucket movements for the operator. This significantly reduces manual inputs, errors and fatigue so grading consistency and accuracy is better for operators of all experience levels. 2D vs. 3D Grade: What’s the difference? 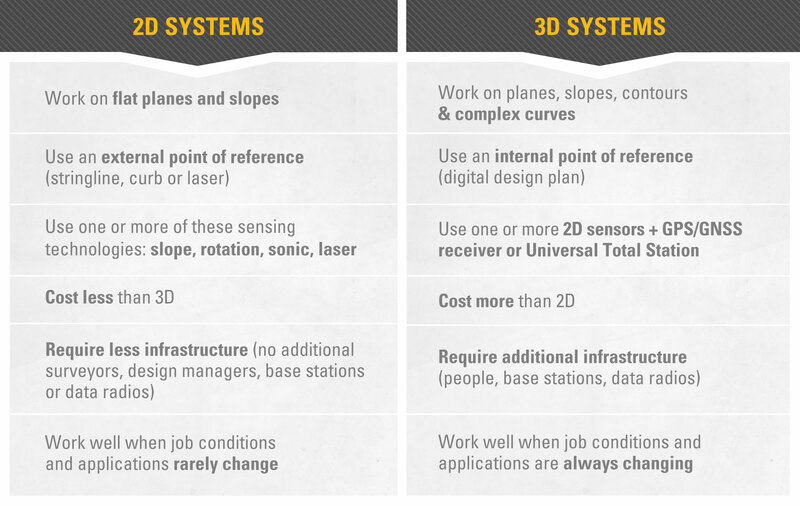 Like most manufacturers, Caterpillar offers 2D and 3D systems. You may depend on GPS to find a gas station or your next cup of coffee, but that doesn’t mean you need it on your heavy equipment. 2D systems are simple, less expensive and easily upgraded to 3D. So before you make any decisions, talk it over with your Cat dealer. Every situation is unique, but studies show Cat Grade technologies can improve productivity by up to 45 percent—and pay for themselves in about six months. Plus, Cat Grade technologies offer added value in safety features such as E-fence. The E-fence feature automatically stops excavator motion using boundaries you set in the monitor for the entire working envelope—above, below, sides and front. E-fence features protect equipment from damage and reduce fines related to zoning or underground utility damage. Automatic boundaries even help prevent operator fatigue by reducing over-swinging and over-digging. Take a look at all the advantages grade technology can bring to your next job. Talk to your Cat dealer or learn more at cat.com.